This patented, cold extrusion process is free of solvents, GMOs, radiation, artificial colors, and preservatives, flavors, herbicides, and pesticides. Sunwarrior products contain absolutely no animal products, dairy, egg, gluten, soy, added sugar, wheat, or yeast. SunWarrior Warrior Blend Raw Protein Vanilla is the perfect protein combination for building muscle, managing weight, curbing appetite, raising metabolism and blowing the roof off your energy levels!! - All while improving your overall health. But most important - IT TASTES GREAT! Research has shown that it is beneficial to alternate protein sources. We recommend you get maximum performance from your proteins by alternating our Raw Vegan Rice Protein with SunWarrior Warrior Blend Raw Protein. You will be treating yourself and your tribe to all the health benefits that both fine products offer! 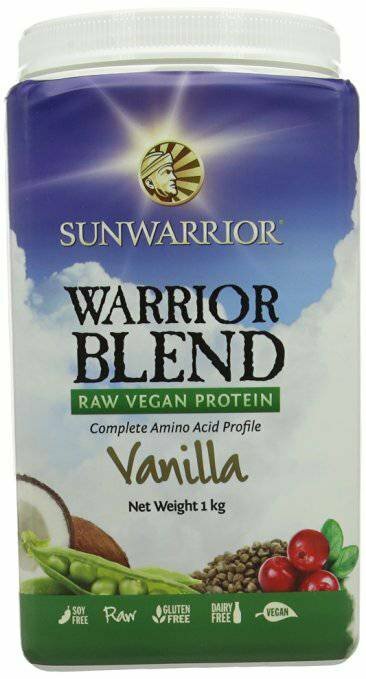 SunWarrior Warrior Blend Raw Protein Vanilla is green, plastic-free, hypo-allergenic, and suitable for any diet or lifestyle (NOT JUST FOR VEGANS)! Fenugreek: It is used both as an herb (the leaves) and as a spice (the seed). The leaves and sprouts are also eaten as vegetables. Fenugreek seeds are a rich source of the polysaccharide galactomannan. They are also a source of saponins. Other bioactive constituents of fenugreek include mucilage, volatile oils, and alkaloids. Glucomannan (Konjac Mannan Root fiber): Soluble fibers such as Glucommannan and Konjac root fibers offer many health-promoting benefits through their ability to form a soft gel with water.